Let me tell you about myself. I know you want to read this. How could you not want to? Day Job: Librarian/Bookstore Manager for the Free Lutheran Schools in Plymouth, Minnesota. 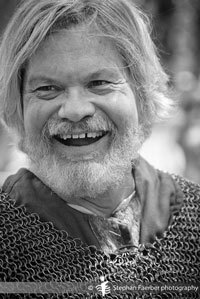 Novels published to date: Erling's Word (1997), Wolf Time(1999), The Year Of the Warrior (2000), Blood and Judgment (2003), West Oversea (2009), Troll Valley (2012). Q: Why do you write at all? A: Wrong. One of my Norwegian great-grandfathers took the name Walker more or less at random after arriving in America (which was rather courageous of him, considering he couldnt even pronounce the letter W). I confess to being a quarter Dane though. Q: How are we supposed to believe anything you say when you tell us youre Norwegian but have brown hair and brown eyes? Q: How many words do you write in a day? A: I try to write 1,000 words a day when Im doing a first draft. After that its revision, and I try to cover ten pages a day. Except for Sundays. I dont write for money on Sundays. A: I bid for them on Ebay. Q: I have a great idea for a book. Want to write it for me? Q: How many Erling books do you plan to write? A: I have no idea. The Erling books are a series, not a serial. Each book stands alone, so you dont have to hold your breath waiting to see how it ends. Im bringing the books out roughly on the thousand-year anniversaries of the events described (i.e., THE YEAR OF THE WARRIOR ends in 1000 A.D., and it came out in 2000 A.D.). 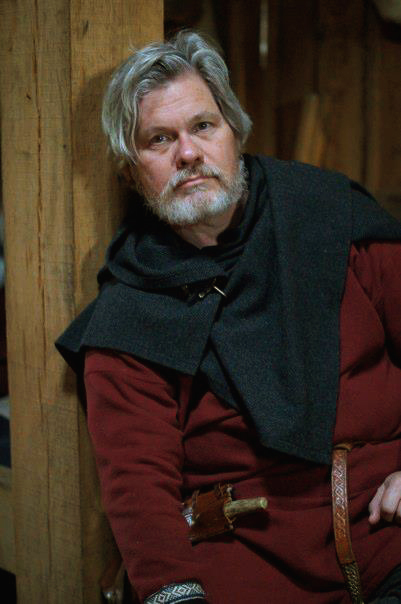 Erling lived until 1028, so I figure to keep writing the books at least till 2028, which means I have to live to nearly 80, something of an accomplishment in my family. 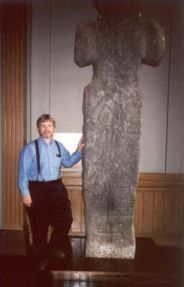 In the photo, you see me in Stavanger, Norway, with Erling Skjalgsson's memorial cross in the Stavanger Museum. I'm the one in the suspenders. Q: How many Epsom books do you plan to write? A: I have even less idea about that. I intended WOLF TIME as a one-off, but then BLOOD AND JUDGMENT (a prequel) came along, and now Im working on DEATHS DOORS, a sequel to WT in which Carl Martell makes a brief appearance. I keep thinking Im done with that cycle, but I keep getting surprised. Q: How come youre still single? A: That question can best be answered by the women whove rejected me. Personally Im not sure I want to know the answer. Q: You dont really believe this Christianity stuff, do you? Q: If Gods a loving God, how come theres so much suffering in the world? A: If the God who made yous not a loving God, why would you care? Q: Can God make a rock so heavy He cant lift it? A: Yes and no. God made M.C. Escher, and Escher could have drawn it. Q: If Christianity is true, how come youre such a jerk? A: You should see what Id have been like without Christianity. 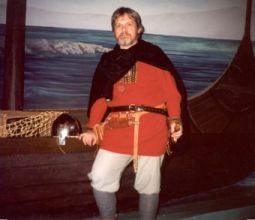 In the photo, I am playing Viking at the opening of the Smithsonian Institution's traveling Viking exhibit at the Science Museum in St. Paul, Minnesota, in November, 2002. I was there with the Viking Age Club of the Sons of Norway. Q: Do cats go to Heaven? A: Sure. The dogs have to have something to chase. Q: Arent your books an obstacle to human progress? A: I certainly hope so. Q: You remind me of somebody who used to act with the Indian River Players in Melbourne, Florida. Was that you? A: Yes. Acting is even more fun than writing, and I wish I still had time for it. Q: How can you say you have a social phobia and be able to act on stage? A: Read some actors biographies. Shyness is a common affliction among actors. Q: If you can act, do you speak in public? A: Glad to, if it fits my schedule. Contact me through this site. Just pay my expenses, or promise to let me sell some books (or sell them yourself) so I can take the deduction. Honoraria will not be refused. Q: I have some money in an African bank I need to send to America, and Ill give you 10% if you let me run it through your bank account. OK? A: Your money is cursed. Give it all to me and let me put it in this handkerchief. Ill remove the curse and give it back to you.